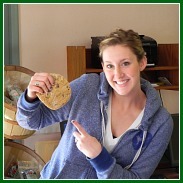 in Cambria, California is a family owned coffee shop and much more. 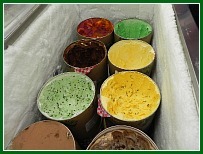 You will always be greeted with a smile, receive excellent service and fantastic food and drinks. This is the best little coffee shop in California. You can expect a relaxing atmosphere where you will feel right at home. Quite often you'll hear someone playing our shop's acoustic guitar or see someone enjoying a game of chess while eating a fresh pastry and sipping on a fresh cappuccino. I personally love the selection of pastries, donuts and fresh brewed coffee. 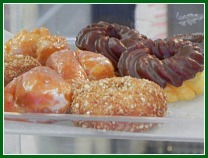 I like to set outside the shop, with a cup of hot coffee and a sugar donut and watch all the people pass by. 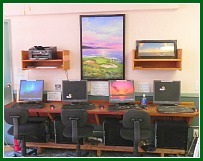 You cannot find a more laid back place to surf the net, drink a cappucino and eat delicious desserts. 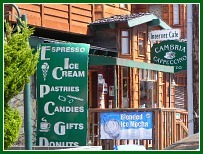 In fact, Cambria Cappuccino is the only place in Cambria with donuts. 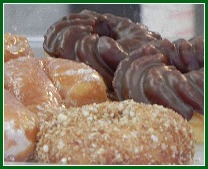 In addition to the donuts you can find fresh baked pastries. My wife and I both love the healthy, freshly baked muffins. 4. Smoothies and much more. 5. Freshly baked Muffins, Pastries, Donuts and much more. 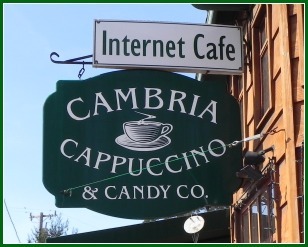 No doubt, once you have visited Cambria Cappuccino you will always want to return. For more information, menu and directions click on this link Cambria Cappuccino. 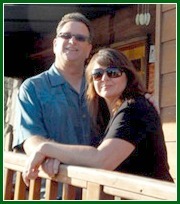 I know you will love Rob, Katie and Kelly...BE SURE TO TELL THEM BOB AND MARY SENT YOU!